SAN DIEGO (Mar. 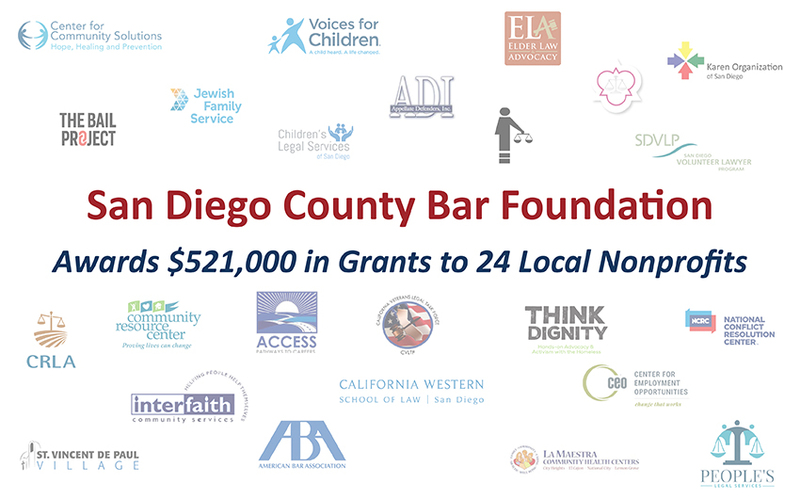 12, 2019) – The San Diego County Bar Foundation has awarded $521,000 to 24 local nonprofit organizations providing legal services, public awareness education and improvements to the region’s justice and court system. The awards, from two Foundation grant programs — general and indigent criminal defense — focus on people and communities that are impacted by poverty, abuse and discrimination. Funds assist organizations that serve refugees, asylum seekers, immigrants, working poor, domestic violence victims, the disabled, veterans, the homeless, low income seniors and at-risk youth. Think Dignity – $50,000 for the Homeless Youth Legal Advocacy Project that helps young people with a variety of criminal legal issues. Voices for Children – $7,500 to provide court appointed special advocates to young children in foster care and fund assessment and triage for additional children’s cases. Since the Bar Foundation began its grants program in 1979, it has distributed more than $4 million to more than 50 legal aid and public interest organizations. For more information about the San Diego County Bar Foundation, or to make a donation, visit www.sdcbf.org. The San Diego County Bar Foundation is the charitable arm of the San Diego County Bar Association (SDCBA). Through this partnership with the San Diego County legal community, the Bar Foundation aims to benefit underprivileged communities in the region, by providing them with access to support, funding and public service programs with legal services. The Foundation’s beneficiaries include more than 50 legal aid and public interest organizations. For more information, visit www.sdcbf.org. No Replies to "San Diego County Bar Foundation Awards $521,000 in Grants to 24 Local Nonprofits"